February 2, 2018—-The human population on planet Earth has grown astonishingly fast and spread over the earth as few other species have. Global population is growing faster than at any time in history. We are now adding over 200,000 people per day to the planet. This amounts to 85,000,000 people each year. What is astonishing is how fast the rate of growth has been increasing. It took hundreds of thousands of years for the first billion to be reached in about 1800. The last billion was added in just 12 years from 1999 to 2011. At the beginning of 2018 global population growth stood at about 7.6 billion. In the early 21st Century, global food production is the highest it has ever been. However, the availability of food varies greatly from place to place. Estimates of the number of people on Earth facing food shortages today vary between 800,000 and two billion. Globally, undernutrition is probably the greatest health problem in the world today. It is clear that food production and distribution is not keeping up with demand regionally, if not globally. Undernutrition does not mean starvation. It means those suffering from undernutrition are in some way being physically affected by not getting either enough food or not getting the right kind of food. The extreme health problem is starvation. According to data from the UN, in 2016 the number of people experiencing undernutrition grew to an estimated 815 million. Of these, approximately 200 million children suffered some form of reduced physical growth. The absence of safe water to drink is widespread over the planet. Estimates if the number of people suffering from a shortage of safe water for drinking ranges from 600 million upwards to two billion. Over a third of the global human population now lives in water stressed regions. The ratio of population living with water related stress may increase by half by 2100. Disease is common in areas where there is no safe water to drink. Diarrhea is the most common problem resulting from contaminated water. Cholera is also prevalent. South Sudan is one of many countries suffering from a shortage of potable water. It is estimated that less than half of the population has access to safe water. In some areas of the country women must spend an hour or more each day to get to a safe water supply and return. The trip must be made regardless of danger. In the country of Puerto Rico, which was devastated by a hurricane last September, many residents do not have access to safe drinking water four months after the event. At the time of this writing the city of Capetown, South Africa, with a population of four million, is faced with the possible shutoff of its water supply. Unless rains come soon this may happen within a few months. A three year drought in the watershed is responsible for the problem. How the population will react to the situation remains to be seen. Between a half billion and a billion people do not have access to a sanitary toilet facility. The majority live in Asia, but this lack of sanitation is spread over the globe, including countries such as Haiti and Mexico. In the beginning when human population numbers were small and scattered, defecating in the open was the standard. This behavior probably predominated over most of human history. It has only been in the last few thousand years that it has not been the standard. As population densities have grown it has become unacceptable. The activity became not only unsavory but unhealthy, as it became a mechanism for transmitting disease. Defecating in the open, whether in fields or vacant lots, is responsible for a many diseases and fatalities, particularly among children. Diarrhea is common among children that play in areas used for defecation. Diarrhea is estimated to kill more than 600,000 children a year under the age of five. The UN estimated that in 2016 nearly 40% children in India had stunted growth due to a combination of undernutrition and disease. The problem now is the numbers and concentration of people spreading diseases through unsanitary conditions. 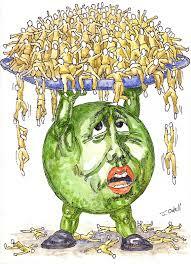 That the human population has been successful on the planet is clearly evident from the growing numbers. However, while the population has grown by leaps and bounds, there has been, and currently is, much suffering by a substantial portion of the population. The number facing severe problems of survival at the current time is the greatest in history. Inherent in this situation are two problems. One is the tremendous rate of growth of the population itself. The second is that of the uneven distribution of wealth and resources. Both the population growth rate and the unequal distribution of resources could be changed fairly rapidly, but is unlikely. It appears neither the wealthiest one per cent nor the world religions want to reduce population growth. In the last year for which data is available 82% of all income went to the richest one percent. 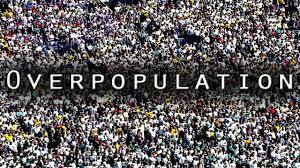 Categories: Population, Poverty | Tags: Population, Population growth | Permalink.